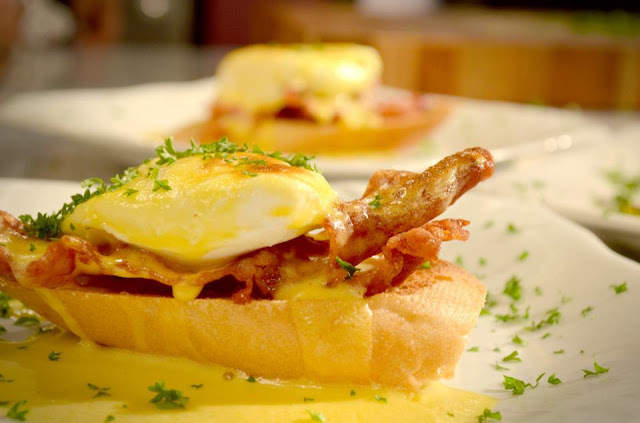 Any egg fest will be incomplete without the All-American classic Eggs Benedict, considered the simplest but also the most demanding egg recipe. Yes, the egg has to be poached just right because undercooking or overcooking it spoils it beyond repair. And the hollandaise sauce has to be done exactly right too. Here, let Chef Boy show you how. 1 Make the hollandaise sauce: drop egg yolk into a blender. Add lemon juice, salt and Tabasco. Pulse for 5 seconds; set aside. 2 Slice butter into chunks and place in a microwave- safe cup. Set microwave on high and melt butter, about 1 minute. 3 While blending the egg yolk mixture on a low setting, slowly drizzle in melted butter. If you do this correctly, the mixture should thicken and take on a creamy consistency. Pour the mixture into a cup or gravy boat and set aside. 4 Fill a large pan with water and set stove at high heat. 5 Toast both halves of the mini baguette. Set on a plate; top each half with 4 slices of bacon. 6 Poach the eggs: Crack three eggs into the boiling water. Cook until eggs turn white; remove with a slotted spoon and set on top of the bacon slices. (Drain the eggs on a paper towel before setting to keep the sauce from losing its texture.) cover with hollandaise sauce and serve.